The TJ9198 is a series of 300mA high performance low dropout linear voltage regulator ideal for mobile or portable applications with high output voltage accuracy, very low quiescent current, very low dropout voltage, and very high power supply ripple rejection (PSRR). The TJ9198 series include enable function to save power moreover the D version provides output auto-discharge function when it is disabled. The series are available with fixed output voltages between 0.8V to 3.6V with 0.1V step. The TJ9198 is stable with 1µF MLCC. 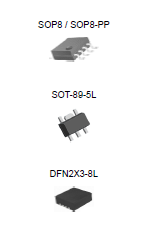 The TJ9198 series are available in a very small 1.0mm x 1.0mm thin DFN4 package, a small SC70-5 package, a SOT23-3 and a SOT23-5 package, which are ideal for high density form factor portable equipment.